Colored or dyed mulch are really bad. Colored mulches are made by grinding up some form of dry wood waste into chips and then dying them with a water based solution. For the dyes to stick to the wood, it has to be dry and some form of chemical binder needs to be used. The inexpensive early dyes often contained toxic heavy metals and other contaminates in the colorants. The natural or organic dyes were far more expensive and hard to find as they did not work as well, faded quickly and became unsightly. Colorant tends to wash off, often stains driveways and sidewalks, and often contains algaecides and fungicides to retard decay and make the color last longer. 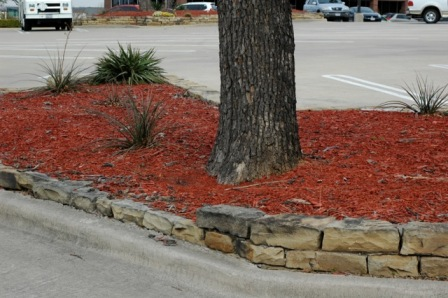 Colored mulches do not support the types and variety of beneficial microbes required for healthy plants as other organic mulches such as a good shredded native mulch or compost. To absorb the dye, the mulch has to be made from fresh dry wood. This may be unused construction wood scraps, mill waste or old pallets. Some vendors grind up and use the hazardous CCA treated wood so the colored mulch may be an unwanted source of arsenic (studies in Florida have found levels of arsenic in colored mulches to exceed Federal safety limits in over 75% of the samples tested). Dry wood waste and old pallets also have a very high carbon to nitrogen ratio (200:1) so if supplemental nitrogen is not added, it may cause a nitrogen tie-up in the soil. Healthy fertile soil has a C:N ratio of only 30:1 hence nitrogen is pulled from the soil as microbes try to break down and decompose the colored mulch. This often results in poor plant growth with increased disease and insect problems. If old pallets were ground up, the colored mulch may contain dangerous chemicals depending on what the pallets were used for. The colored dyes are often used to mask or hide the grayish color associated with recycled waste wood. Mulch from this type of wood also becomes hydrophobic when dry and will not absorb water easily, so plants dry out and become stressed and die. Vendors of some colored mulches use powdered dyes. Powders quickly rub or wear off and the customer is left with an ugly mess. These are more commonly found in the cheaper colored mulches. Dust from the powdered dyes are easily inhaled causing respiratory irritation. Colorants are expensive and if the vendor does not use enough colorant, then the color will quickly fade and look very unsightly. In the best cases, the colorants only last one year and less in warm humid climates. Black colorant such as carbon black may be made by the incomplete combustion of petroleum products (possible carcinogenic to humans and short-term exposure to high concentrations of the carbon black dust may produce discomfort to the upper respiratory tract, through mechanical irritation). Natural carbon black from vegetable origin is used as a food coloring (in Europe it is known as additive E153). Carbon black (PBL-7) is the name of a common black pigment traditionally produced from charring organic materials such as wood or bone. Ask the mulch vendor for a MSDS sheet to be sure which one is used. For more information on mulch, get the Organic Management for the Professional by Howard Garrett, John Ferguson and Mike Amaranthus. If you have any questions on this newsletter or any other topic, tune in Sunday 8am -11 am (CST) to the Dirt Doctor Radio Show. Listen on the internet or find a station in your area. The phone number for the show is 1-866-444-3478. Please share this newsletter with everyone in your address book and all of your friends on Facebook and Twitter to help me spread the word on organics.